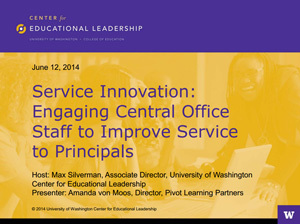 This webinar featuring Amanda von Moos from Pivot Learning Partners is the third in a series of webinars that CEL is hosting related to how central offices can best support principals as instructional leaders. The webinar series features leading experts who address aspects of the Principal Support Framework. This webinar engages the question of how central offices can make it so principals “do less of the rest” and focus primarily on instructional leadership. For most systems this will require transforming how work gets done at the central office, from redesigning processes to creating a school-centered culture of service. Pivot Learning Partners will share lessons learned from a multi-year project focused on this very challenge and will help participants think about how to begin this work in their own systems. This webinar will be of high interest to principals and leaders from across the central office. 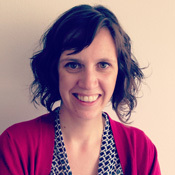 Amanda von Moos leads the Central Office Service Quality (COSQ) team at Pivot Learning Partners, a nonprofit school reform organization based in San Francisco. Her work focuses on partnering with school districts to transform the culture and systems of the central office. Prior to joining Pivot, Amanda worked for Oakland Unified School District where she focused on redesigning central office systems to better serve schools. Amanda roots her work in a passion for building systems that enable principals to focus on teaching and learning, and a deep belief that lasting change only happens when the people are engaged in the process of reimagining and redesigning their own work.